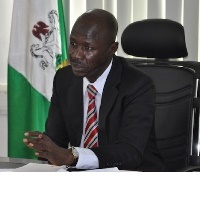 Lawyers acting as technical advisers to criminals — EFCC’s Magu ~ The Big Thing In Town!!! The Acting Chairman of the Economic and Financial Crimes Commission, EFCC, Ibrahim Magu, on Wednesday charged members of the Nigerian Bar Association, NBA, to join hands with the commission to stamp out corruption in the country. Speaking when members of the NBA paid him a courtesy call on Wednesday, Mr. Magu, in a remark titled “The NBA Must Not Allow Corruption To Kill Nigeria”, said unprofessional conducts of some lawyers is giving the NBA a bad name. “Society is not served when prominent members of the bar not only take clearly tainted briefs, but even facilitate the commission of crimes by knowingly supplying the technical know-how and later, helping in the dispersal of the proceeds of crime. “There are lawyers within the fold of the NBA who ought not to be among your noble ranks. “Those people are not fit to be called ministers; rather, they are vandals of the temple of justice,” he said. The EFCC boss further stated that the input of lawyers would be needed to successfully wage the war against fraud, corruption and money laundering. “Law enforcement, just as the judiciary, encompassing the bar and the bench, is a critical link in the justice delivery system of any society. “I dare say that even when opinions and tactics differ, the interest of the two blocs cannot but converge on the overriding interest of the people,” he said. 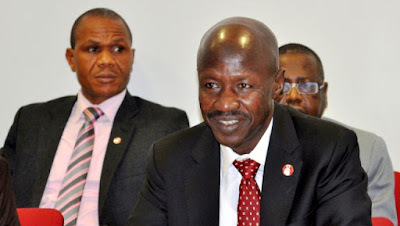 Mr. Magu, who stated that no other anti-graft agency in Nigeria had beaten the record of the EFCC in the areas of prosecutions and convictions, further described the ordinary Nigerian as the victim of money laundering , embezzlement, diversion of funds and frauds. He, therefore, urged them to share in the vision of President Muhammadu Buhari’s war against corruption, while also congratulating the body for supporting the EFCC over the years. Earlier, the president of NBA, Augustine Alegeh, expressed the reason behind the courtesy visit, saying that it was to salute the courage of Mr. Magu in the corruption war. Mr. Alegeh, a Senior Advocate of Nigeria, also said the EFCC and NBA needed to work in synergy for the war against corruption to be won.